Hong Kong-listed casino operator and developer NagaCorp Ltd posted a 53.1 percent year-on-year increase in net profit for full calendar 2018, to US$390.6 million. The growth was fuelled by a 54.9-percent jump in gross gaming revenue (GGR) – to nearly US$1.43 billion – at its NagaWorld complex (pictured), the firm said in a filing on Wednesday. NagaCorp added it had achieved “strong business volume growth across all segments” in 2018, particularly in VIP gaming where it recorded “customer demand for higher table limits and increased rollings”. In addition, “the increasing investment related visitation to Phnom Penh” also contributed to an increase in VIP business volume, it stated. The group declared a final dividend of US$0.0291 per share for the period, to be paid on May 17, upon approvalof the shareholders at the upcoming annual general meeting, to be held on April 26. “Net profit for the year would have increased by 100 percent, excluding the impact of the US$60.0 million fee earned in 2017 in respect of the assignment of licensing right to certain investors to operate a number of electronic gaming machines,” the firm stated. “The company has ready demand but did not opt for similar transaction in 2018,” it added. NagaCorp stated it expected “all top four Macau mega junkets will operate in Naga2 by 2019”. NagaCorp did not identify the four junket operators it was referring to, but added that Suncity Group’s operation at Naga2 would “be moved to a larger and more desirable location in the first quarter of 2019”. Suncity Group is said by investment analysts to be one of the largest VIP gambling organisers in Macau. Macau-based junket operator Guangdong Group confirmed to GGRAsia last month that it was expanding its VIP gaming service to Naga 2. In a written reply to GGRAsia, the junket firm noted at the time that it would be in a trial stage starting in “early January” for its freshly launched service – run under a partnership with other investors – at Naga 2. Earlier this month, Tak Chun Group, another leading Macau investor in gambling junkets, announced it was preparing to open a VIP gaming club at the NagaWorld casino resort complex in “mid-Feburary”. The announcement did not clarify if the new club was in the original NagaWorld building or Naga 2 nearby. NagaCorp “continues to beat expectations as demand remains very robust across all gaming segments and across both properties,” said Union Gaming Securities Asia Ltd analyst Grant Govertsen in a note released after the result announcement by the casino operator. 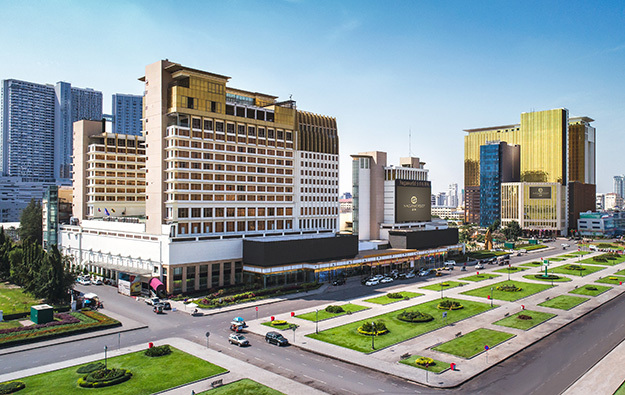 Hong Kong-listed NagaCorp has an exclusive licence to operate casinos in Cambodia’s capital Phnom Penh, and its surroundings. It started operations with the NagaWorld property, now referred to as Naga1, which opened in December 2006. That property now links to Naga2, an expansion that opened in November 2017. “Naga2 significantly increased the appeal, capacity, quality, range and reach of VIP, mass gaming and non-gaming offerings,” the casino operator stated in its Wednesday filing. The casino operator said that only “minimal cannibalisation” had been so far observed between Naga1 and Naga2, “with Naga1 property retaining most of its existing players while Naga2 is attracting customers who are new to NagaWorld”. Naga1 and Naga2 combined are now described as the NagaWorld complex, and are connected via an underground shopping mall known as NagaCity Walk. NagaCorp reported VIP gambling rolling chip volume of approximately US$35.66 billion for full calendar year 2018, up by 68.8 percent from the prior year. The win rate for the period stood at 3.0 percent, it added. That translated into a 71.0 percent year-on-year increase in VIP revenue to US$1.07 billion in the full year. NagaWorld also achieved strong growth in the mass market segment: revenue from main floor tables increased 57.4 percent year-on-year to US$235.7 million in full-year 2018. “This business volume growth is attributable to the increasing visitation at both Naga1 and Naga2 as a result of tourism growth into Cambodia, particularly from China which recorded 69 percent growth in the first 11 months of 2018,” NagaCorp said. Non-gaming revenue at NagaWorld increased by 31.2 percent year-on-year to US$39.9 million in 2018, “primarily contributed by increase in room nights sold with the opening of Naga2, as well as better performance across all the food and beverage outlets in line with the overall increase in visitation to the combined NagaWorld complex,” said the casino operator. NagaCorp is developing a casino resort in the Primorksy Krai region, near the eastern Russian city of Vladivostok. The project – with a first phase of development that will include a 279-room hotel, casino and a conference hall – “remains broadly on schedule for completion in 2019,” the firm stated in its Wednesday filing. “The group believes that its strategy to diversify its business geographically and expand into new casino markets will drive revenue growth in the long term,” NagaCorp said.